Latin students and wordsmiths will love this gem! Weekly exercises teach the definition and etymology of over 1,500 English derivatives, along with prefixes, suffixes, and supplemental Latin vocabulary. Makes an ideal standardized test-prep course, as students improve spelling, learn how to decipher words, and uncover their meanings---even without prior Latin instruction. 240 pages, softcover from Memoria. Grades 8 & up. 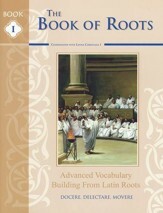 Coordinated for use with Memoria Press' Latina Christiana I, Roots of English provides an introduction to roots for younger students. 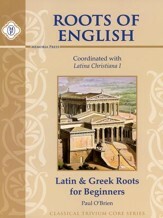 The lessons and Latin roots correspond with Latina Christiana I set. A root, prefix or suffix is given in a clear box with the source language and original & English meaning given. English derivates follow with context questions; most lessons have review quizzes with the occasional context quiz. An introduction explains what roots/prefixes/suffixes are with some examples. 190 pages, softcover. Answer key included.